WASHINGTON, DC, 29 July 2018 – Since attending the annual convention of the National Association of Hispanic Journalists (NAHJ) in Miami, I have posted a number of items about the event, the people who attended and the opportunities presented. It is time now for feedback from two AU students who attended the conference. Laura Romero returns to the School of Communication this fall as a sophomore. Kristian Hernandez finished his graduate studies at the SOC this past May. He is the winner of this year’s AU-Pulitzer Center International Reporting Fellowship, and will be heading to El Salvador to report on immigration. “At the NAHJ 2018 Miami Conference, I was introduced to some of the nation’s leading journalists and story tellers. “The first day of the conference, I attended the Student Bootcamp where social media / ethics, elevator speech and advice on how to make the most of an internship were explained. Arelis Hernandez, a reporter from the Washington Post and Gadi Schwartz from NBC were among those who presented at the boot camp. “The second and third day of the conference were all about networking. NBC hosted a student breakfast where college students and recent graduates were able to meet with journalists and other professionals to discuss internship opportunities and work advice. I was lucky enough to get an interview opportunity and was offered an internship on the spot. The recruiter went over my resume, discussed my experience and offered me a fall internship. “I think the most significant interaction I had was with Kirsten Danis, the managing editor of the Marshall Project. I had applied for a job there last summer to cover immigration in California. I didn’t hear back from them after I applied but during an evening mixer, one of my friends introduced me to Kirsten and we started to talk. I was explaining to her some of the stories I worked on and immediately she remembered my application. She said I was one of the runner-ups for the job in California. But she said they wanted someone with more video experience. “She told me she was looking to hire more immigration reporters in Texas, and to send her my most recent work. “So this time around when I send my application she’ll have a face to the application and it will increase my chances of getting this job. “At these conferences you can spend four days learning from world-class journalists, or you can go to the job fair and talk to recruiters one-on-one to get jobs, internships or great career advice. Because even if you are not qualified, a lot of times they’ll tell you what you need to get there. 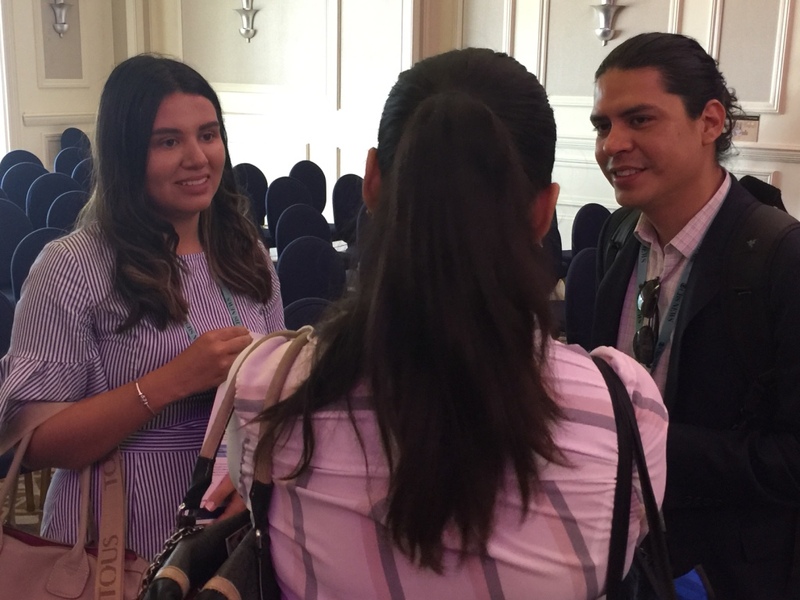 In the photo, Laura Romero and Kristian Hernandez mingle at the Miami conference of the National Association of Hispanic Journalists (NAHJ).